There is little debate that the climate you live in will take its toll on all your wood surfaces if they are not protected. Without adequate protection water and moisture can easily penetrate a wood surface causing it to swell. In the heat of the day the sun beats down on these same surfaces drying them out causing them to shrink up again. This constant expanding and contracting cycle causes the wood to split, crack, and splinter. Unprotected wood is also at risk for mold and mildew. Anytime moisture is present, mold, mildew, and algae can become a problem. Prolonged exposure to these contaminants causes wood rot and decay jeopardizing the wood's longevity. The risk of water damage, sun fading, and mold/mildew rot can all be avoided by protecting the wood with a water repellent and UV blocking wood stain. Surfaces that are more at risk are horizontal surfaces such as decking and tops of handrails. But this does not mean that vertical surfaces are safe from harm, they just take longer to show signs of wear. Vertical surfaces like log homes and cedar wood siding are also subjected to harsh weather and are at risk if not treated. These surfaces need protected with a quality wood stain. Wood stains best for these types of surfaces are penetrating semi-transparent stains that fade over time and will not darken. These particular types of wood stains can be cleaned and reapplied as needed and make maintenance a lot easier. We do not recommend using a film forming other types of heavy pigmented or solid stains or paints. These types of wood stains are tougher to maintain and need heavy stripping or cob blasting to remove them before a new coat can be applied. These wood stains do not last any longer than the penetrating log home stains and only add extra time and costs to maintenance. Semi-transparent log home and cedar wood siding stains that penetrate well and do not darken will provide suburb protection from water damage and sun fading. Once these vertical surface stains begin to fade, all that is needed is a light wash and a stain recoat. They also enhance the beauty of your log home or cedar wood siding by allowing the wood grain to show through. They are available in many different colors and tints. Log home and cedar siding stains will condition the wood and give you many years of protection between maintenance coats. 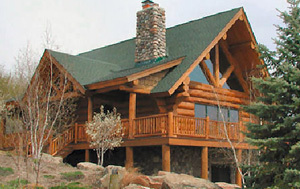 Please ask any questions as to what stain would work for your Log Home or Cedar Siding. If you want UV protection then you have to change the color. The darker the stain color the better the UV protection. You want a penetrating semi-transaprent stain. This way it can be cleaned and reapplied as needed. Look at the Armstrong Clark or TWP. Please check and see what version of the Defy it was and color. As for prep, use a product like the Restore A Deck Kits for the prep. This is a cleaner and wood brightener that you use while pressure washing for the prep. Hard to say if two coats are needed or not as it reapply depends on the age of the stain and how it preps. If you still have a full layer of stain intact on the wood after the prep then one coat is probably sufficient. If not then apply the two coats wet on wet. Best to do this by lightly spraying on the first coat then use a stain pad or brush to apply the second coat within a window of 20-120 minutes. I have an 11 year old fir log home (pacific northwest) I found an empty five gallon bucket of deft stain when we moved in so I'm assuming that is what was used originally. What steps should I take to re-stain our home? what is a wet-wet application, would two coats be required since it's already been sealed once? We bought a 20-yr old rough-sawn cedar sided home that was apparently stained and is now fairly dark (not quite brown)with a very dull/flat finish. We don't know what products were used on the home----the owners are deceased. We DO NOT want to darken the color. We DO want to protect the wood and give it a little sheen. We're beside ourselves in trying to find the right product. Can you give us some options and/or adivece? Thank you! No you need to remove it first. Probably need to hire a pro who can corn cob blast to remove. Mary, remove the CWF with a stain stripper such as the Restore A Deck or the HD80. Use a wood brightener when done. Stain with TWP 1500 series when done. Need best recommendations on how to restore red cedar wood shingles previously stained with clear DWF stain that now darkened with time. Try TWP or Armstrong Clark. I have a half pine log home, and I have installed brand new cedar post, and railings. The railings and post are new wood, but hey have been up since January. I have sanded, cleaned, and brighten them. I just finished the pain full job of stripping Sikkens, from the cabin. I did use Restore A deck stain stripper. It did remove some stain, but not all of it. HD 80 removed removed what Restore A deck did not. After sanding,and brightening. I am now ready to stain. I like the look of Sikkens, but I never want to go through that stripping process again. I have read good reviews about several different stains. I need a stain for cedar, and pine. Vertical and horizontal application. New wood, and stripped wood.long lasting, and low maintenance. Does such a stain exist. Gary, without know the old stain type or brand it is hard to say if stripping will work. The Restore A Deck Stain Stripper is our best brand and works well but will not remove a shiny urethane type finish. For the stain, I would look at the TWP 1500 or Defy Extreme for this.